The genetic and physiological pathways regulating behavior in solitary species are hypothesized to have been co-opted to regulate social behavior in social species. One classic example is the interaction between vitellogenin (an egg-yolk and storage protein) and juvenile hormone, which are positively correlated in most insect species but have modified interactions in highly eusocial insects. In some of these species (including some termites, ants, and the honey bee), juvenile hormone and vitellogenin levels are negatively correlated and juvenile hormone has shifted its role from a gonadotropin to a regulator of maturation and division of labor in the primarily sterile workers. The function of vitellogenin also seems to have broadened to encompass similar roles. Thus, the functions and molecular interactions of juvenile hormone and vitellogenin are hypothesized to have undergone changes during the evolution of eusociality, but the mechanisms underlying these changes are unknown. Bumble bees offer an excellent model system for testing how the relationship between juvenile hormone and vitellogenin evolved from solitary to social species. Bumble bee colonies are primitively eusocial and comprised of a single reproductive queen and facultatively sterile workers. In Bombus terrestris, juvenile hormone retains its ancestral role as a gonadotropin and is also hypothesized to regulate aggressive behavior. However, the function of vitellogenin and its interactions with juvenile hormone have not yet been characterized. By characterizing vitellogenin RNA expression levels (vg) in B. terrestris we show that vg is not associated with task and only partially associated with worker age, queen presence, and caste (queen vs worker). The correlations of vg with ovarian activation were not consistent across experiments, but both vg and ovarian activation were significantly associated with levels of aggression experienced by workers. Treatment with juvenile hormone did not affect vg levels in queenless groups. We suggest that social interactions affect vg levels more strongly than a worker’s reproductive physiological state, and that juvenile hormone and vg are uncoupled in this species. Thus, although juvenile hormone maintains its traditional role as gonadotropin in B. terrestris, vg has already been co-opted into a novel role, consistent with the model that Bombus represents an intermediate stage in the evolution of eusociality. The proximate and ultimate mechanisms leading to the evolution of eusocial behavior, in which there is a reproductive division of labor between highly fecund females (queens) and largely sterile females (workers), has long fascinated biologists. It has been hypothesized that eusocial behavior evolved from solitary behavior via changes in expression of existing “toolkits” of genes , in which ancient molecular and physiological pathways became modified and expressed in new contexts, thereby leading to profound behavioral and physiological changes. This is exemplified in the major functional changes that have occurred in juvenile hormone (JH), a principle regulator of physiological processes in insects, during the evolution of eusociality. However, except in the case of Apis mellifera, whether and how the downstream transcriptional responses to JH evolved have not been explored. Here, we examined the interactions between JH and one of its main transcriptional targets, vitellogenin (vg), in a primitively eusocial species (the bumble bee Bombus terrestris), and compare our results with studies of the interactions between JH and vitellogenin in other solitary and social species. JH displays pleiotropic functions during the insect’s life cycle. In pre-adult stages it regulates developmental processes, while in adult females it induces vitellogenesis (the production of the major yolk protein) [2–4]. However, while the role of JH in development (including pre-adult caste differentiation) appears to be widely conserved across insect species, its role in reproduction has been subjected to many modifications. In some highly eusocial insects, such as the honey bee and several termite and ant species, it no longer acts as a gonadotropin but instead regulates maturation and the division of labor in the worker caste [2, 5–12]. Modifications in the hormone’s traditional role have also been reported in several non-social insects in which JH is either not essential for female reproduction or is not an absolute requirement for ovarian activation [13–20]. Furthermore, in several primitively eusocial hymenopteran species JH regulates formation and maintenance of dominance hierarchies in addition to its gonadotropin role [21–23]. Many effects of JH appear to be mediated by vitellogenin, and JH and vitellogenin interact in many species [24–26]. As the major egg yolk protein in insects, vitellogenin is synthesized in the abdominal fat body, released into the hemolymph, and sequestered by the developing oocytes [24, 25]. In most insects, mainly non-social species, JH positively regulates vitellogenin levels [18, 20, 27–34]. For example, in adult female Locusta migratoria, blocking JH action either by ablation of the corpora allata (the site of JH synthesis) or by treatment with JH inhibitors abolishes vitellogenin production. Furthermore, vitellogenin biosynthesis can be induced in these females by injection or topical application of JH or an active JH analogue [24, 35]. An exception is the parasitic wasp Pteromalus puparum, a non-social Hymenopteran species in which vg expression and JH titers are negatively correlated, and JH seems to play only a secondary role in stimulating oocyte growth . In contrast, social insect species exhibit a much more complex interplay between JH and vitellogenin, and vitellogenin appears to have acquired new functions. For example, in honey bee (Apis mellifera) workers, high JH levels significantly reduce vg transcription as well as vitellogenin protein levels [36–38]. Interestingly, in the honey bee, vitellogenin operates in a negative feedback loop with JH, apparently slowing the onset of foraging behavior by suppressing JH titers, and thus appears to function as more than just an egg-yolk protein [36, 38–40]. Although in most of the best studied ant species, including Solenopsis invicta and Pogonomyrmex barbatus, JH retains its gonadotropin function, in several primitively eusocial ant species JH levels and vitellogenin levels and/or egg production are negatively correlated: topical application of JH to founding queens reduced egg production in Harpegnathos saltator and reduced fertility in Streblognathus peetersi. In some termite species, JH does not always stimulate vitellogenesis in reproductives. For example, JH synthesis correlates with the number of vitellogenic ovarioles in nymphoids but not in ergatoids of Reticulitermes flavipes[6, 7], and an elevated JH titer may inhibit reproductive processes in immature alates of Zootermopsis angusticollis. In Hodotermopsis sjostedti, JH titers of secondary reproductives are low compared to nymphs, pre-soldiers, and soldiers [8, 9]; whereas in queens of the termite Reticulitemes speratus, JH and vitellogenin were found to correlate in an offset pattern, with an increase in JH titer preceding the rise of vg expression levels . Although the number of species studied is still limited, we can hypothesize that JH and vitellogenin have undergone a change in their roles and the way they interact during the transition from solitary to sociality . Bombus terrestris colonies offer an excellent model system in which to examine how the interactions between JH and vitellogenin changed during the evolution of eusociality. B. terrestris are eusocial, with a reproductive division of labor between morphologically distinct castes , and JH has maintained its original role as gonadotropin and is positively correlated with reproduction in both queens and workers [22, 47–49]. However, the role of vitellogenin and its interactions with JH have not been explored in this species, and whether vitellogenin retains its ancestral role and functions largely in reproduction or if it has acquired other functions remains elusive. Furthermore, the interactions between vitellogenin and JH are also uncharacterized in this species: it is unknown if these two factors follow the ancestral pattern (positively correlated), have become uncoupled, or are negatively correlated, as observed in other eusocial Hymenopteran species. In many social insects (mainly primitively social species), reproductive competition between the queen and workers and among workers is accompanied by overt aggression. This is particularly apparent in B. terrestris, where aggression is a major means by which to establish reproductive dominance in queen-worker and worker-worker competition [46, 50–56]. JH titers were hypothesized to correlate with dominance and aggressive behavior in bumblebee workers, but the experimental results of several studies were equivocal [22, 49]. Aggression also precedes ovarian activation in workers  and previous aggressive encounters by workers are sufficient to establish the reproductive hierarchy among them . This raises an intriguing possibility that the molecular and physiological processes that regulate aggressive behavior (and therefore shape social context) occur upstream to the processes involved with vitellogenesis and ovarian activation. Most of the studies to date, to our knowledge, that sought to explore the relation between JH and vitellogenin were carried out with either non-social species or highly eusocial insects, in which aggression is rare or absent. In the bumble bee B. terrestris, aggression is a major factor in colony social behavior, but the impacts of dominance hierarchy on the interplay between JH and vitellogenin have not been examined. Here, we investigated the interactions between JH and vg RNA expression levels. First, we examined vg expression specificity in relation to caste, reproduction, and worker task allocation, by monitoring its levels in virgin and mated queens, sterile and reproductive workers, and workers engaged in foraging or brood care. Second, since worker ovarian activation is associated with multiple factors (age, presence or absence of the queen, or position in the dominance hierarchy) we uncoupled all of these factors by manipulative experiments and monitored how these affect vg expression. We then extended this experiment by examining the effect of JH regulation on vg expression in workers introduced into two different kinds of social groups, in which they experienced different levels of aggression. We measured ovarian activation and vg expression levels in the heads of queens and workers (Table 1) and statistically compared the results across the various groups (Table 2). Levels of vg were significantly higher (6x) in fertile queens than in 10 day-old, queenless (QL), fertile workers. Virgin queens (with inactivated ovaries) also had higher vg expression levels compared to 4-day-old, queenright (QR), sterile workers (2.4x), but this difference was not significant. Levels were also significantly higher (40x) in fertile queens compared to virgin queens, and significantly higher (16x) in 10-day-old, QL, fertile workers compared to 4-day-old, QR, sterile workers. Finally, although ovarian activation levels were significantly higher in nurses than in same-age foragers, vg levels were not significantly different. Data are presented as means ± SE. Comparisons of caste, reproduction, age and social condition were performed using a Mann-Whitney test. Task was compared using a Wilcoxon matched paired test. Levels of vg thus seem to be affected by both caste and reproductive state, but not by task. However, there were many parameters that differed among our fertile and sterile workers in addition to ovarian activation, including age and social context (presence or absence of the queen). In the following experiment, we uncoupled the effects of age, social context (queen presence/absence), and ovarian activation, in order to determine which, if any, factor was primarily associated with vg expression levels. The effects of age and queen presence/absence on ovarian activation and vg levels were examined in cages of 5- and 8-day-old workers that were kept either in QL or QR groups (Tables 1 and 2). QL workers usually posses ready-to-lay eggs at the age of ~7 days, thus only 8-day old workers were predicted to have vitellogenic oocytes in their ovaries. Among the QR workers, neither vg levels nor ovarian activation were significantly different between 5-day and 8-day old workers. Among the QL groups, 5-day-old workers had significantly lower ovarian activation, but still comparable levels of vg expression compared to the 8-day-old workers. In this same group of workers, we examined the effects of social condition (QL vs. QR) on ovarian activation and vg levels. Both 5- and 8-day-old workers in QL groups had significantly higher ovarian activation than age-matched workers in QR groups, but levels of vg were again not significantly different. In these experiments, we examined the expression of vg in the dominant worker (as determined by ovarian activation level) in each group (see Methods). If vg levels are associated with dominance, this may explain the lack of variation across the groups. Thus, we further explored the effects of social interactions on vg expression in QL groups of workers. In QL worker groups, workers establish reproductive dominance hierarchies via aggressive interactions. Aggression precedes ovarian activation [54, 56] and thus aggressive interactions can be used to determine a bee’s position in the dominance hierarchy before ovarian activation is completed. We established QL worker groups using callow (<24 hour old) workers (7 workers/cage). Previous behavioral observations revealed that workers could be classified on the basis of aggressive interactions during days 3 and 4 after group establishment . We therefore collected these groups for analyses at the end of day 4. We identified three categories of workers in each cage: the most aggressive (1st in hierarchy), the most aggressed (2nd in hierarchy), or the most passive bee (7th in hierarchy). Passive workers performed aggressive behaviors least frequently. Among the two top bees in the hierarchy, the aggression exhibited by the aggressive (1st) bee was almost twice as frequent as that exhibited by the aggressed (2nd) bee. 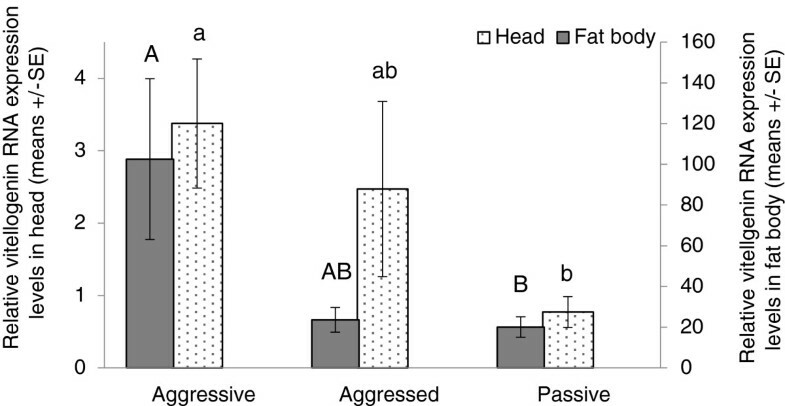 The aggressed (2nd) workers received a higher amount of aggression compared to the other two bee categories (Figure 1). Judging from the low aggression that the aggressive (1st) bee received, we can conclude that the majority of the aggression exhibited by the aggressed (2nd) bee was towards the other bees in the group and not towards the most aggressive (1st) bee in the hierarchy. Aggression in queenless worker groups. The number of aggressive behaviors (sum of humming, darting and attack events) during 60 minutes performed or received by callow workers that were kept for 4 days. Observations were performed during days 3-4 after group establishment. Each group is composed of full sisters originating from a different colony (except for one, n = 15 groups, 14 colonies). Data are presented as means ± SE. Since the workers were only 4 days old when sacrificed they all had relatively low ovarian activation, with oocytes averaging less than 0.5 mm compared to the size of ~3 mm of ready-to-lay eggs in B. terrestris. There were no significant differences between the mean oocyte sizes of the three bee categories (0.49 ± 0.04, 0.42 ± 0.04, and 0.31 ± 0.04 mm for 1st, 2nd and 7th bees, respectively (14 groups); Kruskal-Wallis test H (2, n = 42) = 5.97, p > 0.05). Significant differences were found in the vg RNA expression levels between aggressive (1st) and passive (7th) worker categories both in the head and in the abdominal fat body, with the aggressive bees possessing the highest vg expression levels (head: Kruskal-Wallis test: H(2, n = 45) = 7.12, p = 0.02 followed by multiple comparison post hoc test p = 0.02 for passive vs. aggressive. Abdominal fat body: Kruskal-Wallis test: H(2, n = 14) = 6.76, p = 0.03 followed by multiple comparison post-hoc test p = 0.03 for aggressive vs. passive). The aggressed (2nd) workers had intermediate levels of vg expression that were not statistically significantly different from either the aggressive (1st) or the passive (7th) worker categories (Figure 2). The effect of aggression on the relative vg RNA expression levels in queenless groups. Callow workers were kept in seven worker groups for 4 days. The “aggressive” individual was the most dominant worker that performed the highest number of aggressive behaviors during days 3-4; the “aggressed” individual was the worker that received the highest number of aggressive behaviors; and the “passive” worker performed and received the lowest number of aggressive behaviors per group. Each group was composed of full sisters originating from a different colony (except for one, n = 15 groups, 14 colonies). The relative amounts of vg in the heads were tested in all 15 groups and in the fat body in 5 groups. Data are presented as means ± SE. Different letters above the columns represent statistical differences at α = 0.05. Here, we compared aggression, ovarian activation, and vg expression levels in JH-treated, Dimethylformadide (DMF) treated (solvent control), and untreated control workers (“treatment”) that were introduced into either peer or older established groups (“group-type”). We hypothesized that workers introduced into peer groups (i.e., workers of the same age as the introduced worker) would have an equal probability of becoming dominant as any of the other workers; whereas workers introduced into established groups (i.e., of workers that are four days older than the introduced worker) are more likely to remain subordinate. Thus, workers introduced into peer groups are expected to receive and perform more aggressive behaviors while attempting to achieve dominance, and to activate their ovaries more rapidly compared to workers introduced into the established groups. We also hypothesized that JH treatment should stimulate vg expression and aggression (and thus ovarian activation) in both contexts, but more profoundly in the peer groups in which the social context is more tolerant to dominant behaviors. Two experiments were performed. In the first we examined the effect of group type on ovarian activation by introducing callow workers into the two group types and examining their ovarian activation 7 days post-introduction. Workers that were introduced into established groups had lower ovarian activation relative to that of workers that were introduced into peer groups (T-test: t = 2.46, n1 = 15, n2=16, p = 0.01) (Table 3). This indicates that our manipulation of social state (peer/established) impacted the reproduction of the introduced workers, and thus their ability to achieve reproductive dominance. In the second experiment we examined the effects of treatment (JH/DMF/untreated control) and group type (peer/established) on ovarian activation, vg RNA expression levels, and aggressive interactions over a four-day post-introduction period. 1Nested ANOVA, treatment is nested in group-type: f(4,48) = 0.7, p = 0.56, For group-type only: f(1,48) = 0.91, p = 0.34. 2Nested ANOVA, treatment is nested in group-type: f(4,48) = 0.12, p = 0.97; For group-type only: f(1,48) = 5.4, p = 0.02. 3Nested ANOVA, treatment is nested in group-type: f(4,48) = 0.67, p = 0.61; For group-type only: f(1,48) = 1.14, p = 0.29. 4Nested ANOVA, treatment is nested in group-type: f(4,48) = 0.35, p = 0.84; For group-type only: f(1,48) = 5.27, p = 0.026. Data was transformed using arcsin. 5Nested ANOVA, treatment is nested in group-type: f(4,77) = 1.83, p = 0.13; For group-type only: f(1,77) = 0.16, p = 0.68. Since ovarian activation in callow workers takes about 7 days [57, 58] it was accordingly low in the examined 4-day-old workers and not significantly different between group type or treatments for all group-types and all treatments (Nested ANOVA, treatment is nested in group-type: f(4,77) = 1.83, p = 0.13; for group-type only: f(1,77) = 0.16, p = 0.68). Within a group type there was no effect of treatment (JH, DMF or untreated control) on vg expression levels in the abdominal fat body (Figure 3) or head (data not shown). Interestingly, however, there were significant differences between the groups types. Levels of vg in workers introduced into the established groups were higher than in those introduced into the peer groups, irrespective of treatment (Nested ANOVA, treatment is nested in group-type: f(4,36) = 0.29, p = 0.87; for group-type only: f(1,36) = 8.06, p = 0.007) (Figure 3). Relative vg RNA expression levels under JH treatment in different social contexts. Four-day-old workers were introduced into either peer or established groups (9 and 5 workers in each category in peer and established groups, respectively) and were assigned to one of three treatments: (1) 100 ug JH-III diluted in 5 ul DMF applied to the thorax before introduction; (2) 5 μl DMF; and (3) untreated control groups. All workers were callow when introduced and were kept for 4 days. Groups were composed of full sisters originating from the same colony. Each group was taken from a different colony. Data are presented as means ± SE. Different letters above the columns represent statistical differences at α = 0.05. Treatment (JH, DMF and untreated) did not affect the level of aggression performed or received by the introduced worker in either peer or established groups (see statistics in Table 3). However, there were differences in aggression as a function of group-type. The total aggression (i.e. the sum aggression that was performed by all three workers in each group) was not significantly different among groups, irrespective of the group-type or treatment (nested ANOVA, treatment is nested in group-type: f(4,48) = 0.7, p = 0.56; for group-type only: f(1,48) = 0.91, p = 0.34). 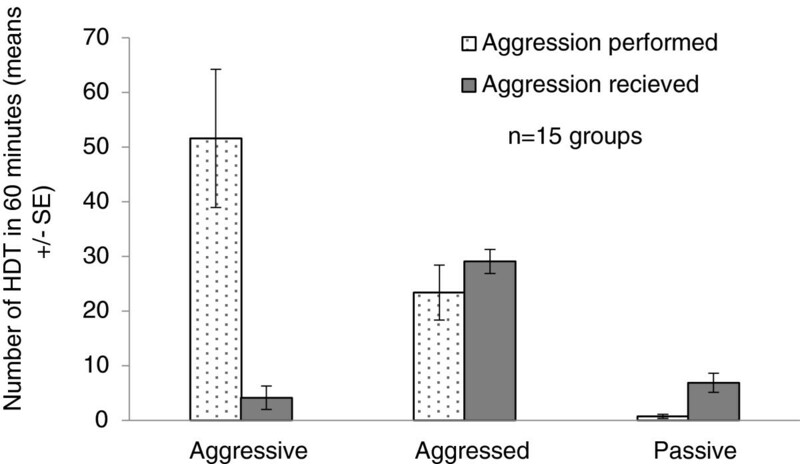 Nonetheless, workers that were introduced into peer groups were significantly more aggressive towards their group-mates and were involved in more aggressive behaviors compared to workers that were introduced into the older established groups (Aggression performed: Nested ANOVA, treatment in nested in group-type: f(4,48) = 0.12, p = 0.97; for group-type only: f(1,48) = 5.4, p = 0.02; Aggression involved: Nested ANOVA, treatment in nested in group-type: f(4,48) = 0.35, p = 0.84; for group-type only: f(1,48) = 5.27, p = 0.026). However, the amount of aggression that the introduced workers received was comparable, irrespective of the group type into which they were introduced to (Nested ANOVA, treatment in nested in group-type: f(4,48) = 0.67, p = 0.61; for group-type only: f(1,48) = 1.14, p = 0.29). It has been hypothesized that complex social behaviors evolved by adapting and modulating existing genetic “toolkits” so that they are expressed in novel contexts . In the case of toolkits involving key genes in endocrine signaling pathways, changes in expression may produce profound changes in morphology, physiology, or function. Two outstanding examples of this model are vitellogenin and juvenile hormone in adult insects. These two factors play critical roles in shaping reproductive processes in many solitary insects [24–26], but have been co-opted to function in maturation and division of labor in Apis mellifera honey bee workers [10, 40]. Furthermore, the molecular interactions between these two factors have undergone a fundamental alteration in the honey bee: in the ancestral state, JH appears to positively regulate vitellogenin transcription (vg), but in the honey bee JH and vg appear to function in a negative feedback loop [36, 38–40]. Here, we examine the function and interactions of JH and vg in a primitively eusocial species, B. terrestris, in which JH has retained its ancestral gonadotropin role. We demonstrate that JH and vg expression are uncoupled, and that vg expression appears to be more tightly associated with social context than with reproductive physiology in workers. These results suggest that B. terrestris represents an intermediate stage in the evolution of the JH-vg pathway, from its ancestral role in reproduction to its new role in mediating worker social interaction and division of labor in advanced eusocial species. Our studies suggest that vg expression levels in B. terrestris are primarily associated with caste and social context, and are not strongly correlated with ovarian activation in workers. Expression levels of vg were higher in active queens than in workers, which is consistent with studies in honey bees , and with the superiority of the B. terrestris queen over workers in terms of egg production. Unlike the honey bee, however, vg expression levels were not associated with worker task. Finally, while vg expression levels were associated with reproductive state in queens, their levels were not strongly associated with reproductive state in workers. When correlations between vg and ovarian activation were observed in workers, they were likely to be mediated through aggressive behavior. Since aggression precedes ovarian activation in bumble bees [54, 56], these two factors are closely intertwined. Selecting younger bees that differ in aggression levels but have inactive ovaries allowed us to disentangle the effects of aggression and ovarian activation, and demonstrated that expression of vg is higher in aggressive workers even before ovarian activation takes place. Thus, vg expression primarily correlates with aggression and only secondarily with reproduction. This is consistent with studies in the honey bee in which vg expression levels do not differ between sterile and reproductive workers , or between virgin queens and instrumentally inseminated queens with activated ovaries . These inconsistent correlations of vg with reproduction can be explained in several ways: first, vitellogenin may evolve to function beyond the restricted context of reproduction [10, 61]. Recent studies in honey bees showed that vitellogenin has multiple coordinating effects on social organization, such as pacing the onset of foraging behavior, priming bees for specialized foraging tasks, and influencing worker longevity . Vitellogenin in honey bees was further suggested to reflect the nutritional status of the bee , and is associated with changes in gustatory responsiveness  and metabolism . In several other species, vitellogenin can reduce oxidative stress by scavenging free radicals and promote longevity [38, 66]. Recently, vitellogenin was linked with immune defense and was suggested to be produced under immune challenge. In fish, vitellogenin has been shown to recognize pathogens and to promote macrophage phagocytosis [61, 67]; and in the honey bee, vitellogenin is downregulated in parasite infested bees . These studies suggest that vitellogenin has many divergent functions in different species, and is not restricted solely to reproduction. A second explanation for the inconsistencies in correlations is that vitellogenin may have evolved to regulate reproduction indirectly. In solitary species where there is no competition over reproduction, JH may directly regulate vg levels, which in turn directly regulate ovarian activation. However, in primitively social species, social groups are composed of both dominant and subordinate females that compete over reproduction, and egg-laying is monopolized by the most aggressive females. Thus, a double control system, in which vg responds to aggression levels instead of or in addition to JH levels, may be useful in order to prevent the subordinate females from overloading their system with higher vg levels when reproduction is not feasible. A recent study in the harvester ant, Pogonomyrmex barbatus harbors, may support this hypothesis: in this species, the gene for vitellogenin has been duplicated and subfunctionalized to acquire reproductive and non-reproductive functions - mainly behavioral - in sterile workers . A third possible explanation is that vitellogenin’s mode of action masks the positive correlation between vg levels and reproduction. For example, regulation may occur at the level of translation to the protein, or at the rate at which the circulating protein is sequestered in the developing oocytes. For example, in grasshoppers preparing for oviposition, high levels of vg mRNA persist but translation diminishes [24, 27, 30]. A similar mechanism was suggested for Apis mellifera. If a similar mechanism operates in B. terrestris, vg mRNA levels would remain high while protein levels decrease in workers with almost fully developed ovaries. This may also explain why 5- and 8-day-old workers do not differ in their vg levels despite large differences in their ovarian activation. Further studies are needed to determine whether these hypothesized alternative regulatory mechanisms are operating. We found no effect of increasing JH titers on vg expression in worker bees. Since JH-vg interactions may be dynamic, it is possible that the timepoint we used (4 days post JH treatment) did not fully capture any effects on vg. However, previous study at this timepoint demonstrated that JH treatment resulted in significant changes in brain expression levels in B. terrestris. Furthermore, we selected this timepoint because it takes seven days for workers to produce fully mature ooctyes, and thus the oocytes of four day old workers are immature. This is critical for two reasons: first, the correlation between vg mRNA and vitellogenin titer occurs only during the oocyte growth period, rather than when the oocyte has reached its ready-to-lay size [24, 27, 30]. Second, JH does not induce an immediate response at the vitellogenin protein levels, but a progressive one. In Locusta migratoriaIn, for example, vitellogenin shows only a small increase in the first 48 hours post-treatment and then steep increases to its maximum at 72 hours. Thereafter it gradually declines [30, 35]. However, though we selected this time point to optimally capture any effects of JH on vg, it is possible that the effects occurred at an earlier or later time point. Furthermore, since we did not measure JH levels in the hemolymph of the bees, we cannot preclude the possibility that the lack of effect of JH was due to its post-application degradation. Finally JH may exert its primary effects on other endocrine glands or tissues, and only indirectly affect vitellogenin synthesis , which should be taken into consideration when measuring vg RNA levels in response to JH. Nonetheless, despite choosing the seemingly optimal time point, JH application did not appear to have any effect on vg expression. According to these findings, either both JH and vg are regulated by a third party; or JH regulation of vg, if exists, must be indirect. The correlation of vg with aggression, the fact that aggression precedes ovarian development (the aggressive worker is the most fertile one in more than 90% of groups ), and that JH affects ovarian activation in workers (but not aggression) [47, 72], lend credence to the hypothesis that both JH and vg are regulated by a third player. Alternatively, it is possible that the gonadotropin effect of JH in B. terrestris is separated from the association between vg and aggression, and that both pathways (vg-aggression and JH production) independently but jointly affect ovarian activation. What might be the selective advantages of two disparate mechanisms for regulating reproduction? The queen presumably inhibits worker reproduction through reducing their JH levels . Even when worker reproduction occurs, only about 40% of the workers lay eggs, although about 70% have activated ovaries . Since resources are limited and not all the eggs can develop to adults, egg-laying workers gain their position through aggressive interactions and establishment of a dominance hierarchy [54, 56]. Thus, access to reproduction requires detection of both the right social condition of the colony (cooperative vs. competition) and the right social context among workers (dominant vs. subordinate). While the first can be achieved through manipulating the JH levels in subordinates by the queen or dominant workers, the second can be mediated through aggressive interactions that affect vg levels and thus determine which bees will reproduce. Such a double control ensures that efforts will be invested in reproduction only when feasible. While vg levels were not affected by JH, they were affected by social context. Interestingly, vg levels were higher in bees introduced into established groups although they exhibited less aggression compared to those introduced into peer groups. This is in contrast to the finding that vg levels were higher in aggressive compared to passive workers (Figures 1 and 2). One explanation is that it is not only the aggression performed by workers that matters, but also the aggression they receive. Workers that were introduced into the established groups in experiment 4 had higher vg, performed significantly less aggression, and received slightly more aggression (although not statistically significant Tables 1 and 2, Figure 3), while both aggressive and aggressed workers in experiment 3 expressed higher levels of vg (Figures 1 and 2). Thus, it is possible that vg is higher in both the performer and receiver of aggression (but not in passive workers). This hypothesis is supported by ample evidence from the bees’ life cycle. For example, larger groups of workers, in which aggression is higher, are more productive (in terms of ovarian activation and egg laying) compared to smaller ones . Recently published studies conducted with paired bees of B. impatiens have suggested that aggression in one worker stimulates aggression in the other , though whether vg levels rise in both workers remains to be determined. Finally, newly mated queens are stimulated to lay eggs in the presence of other queens or workers, with egg-laying following a period of intensive aggressive interactions (personal observations, EA). However, this hypothesis still remains to be tested directly. Here, we comprehensively examined the interactions between JH and vitellogenin in a primitively eusocial species, B. terrestris. We have demonstrated that vg expression levels are higher in queens than in workers, and in laying versus virgin queens, but that levels in workers are not associated (or only partially associated) with age, ovarian activation, task, or queen presence. Interestingly, however, there is a strong association between expression levels of vg in workers and the amount of aggression performed or received. Furthermore, JH does not regulate vg levels in queenless workers. Our results suggest that although JH has retained its traditional role as a gonadotropin in bumble bees, vitellogenin has already been co-opted into a novel role and is regulated by different, uncharacterized, physiological factors, which, in turn, may be regulated by aggression. Further studies in bumble bees may reveal the molecular and physiological mechanisms by which the vg-JH pathway became uncoupled in this system. Colonies of B. terrestris (Yad Mordechai Apiary, Israel) were obtained 3–5 days after the first worker had emerged. They were maintained in the laboratory in nest boxes (23 × 23 × 10 cm) at a constant temperature of 30°C and 50%–60% relative humidity, and supplied ad libitum with a sugar solution and fresh pollen collected from honey bee colonies. In all the experiments described below, all workers from within a group were taken from the same colony and different groups were taken from different colonies (in total we used 40 different colonies in the current study). This was done in order to reduce the variability within groups while maximizing biological variation among replicates. All the bees were sacrificed by freezing on dry ice and stored at -80°C. We examined vg levels (either head or fat body or both) and ovarian activation in all bees. Individual bees were dissected under a stereo-microscope in double-distilled water. The length of the terminal oocyte in the three largest ovarioles (at least 1 ovariole per ovary; workers possess 4 ovarioles per ovary) was measured with a scaled ocular. Mean terminal oocyte length for each bee was used as an index of ovarian activation [54–56, 75]. We identified the bumble bee vg gene using the NCBI/blast home page (http://blast.ncbi.nlm.nih.gov/Blast.cgi). The gene for vitellogenin was annotated and characterized in B. ignitus and B. hypocrite, two species very closely related to B. terrestris. We searched for homologs to the B. hypocrita vitellogenin gene in the B. terrestris database (GenBank accession number taxid: 30195). The deduced vitellogenin sequence of B. terrestris (NCBI Reference Sequence: XR_131915.1) was aligned with that from B. hypocrita (taxid: 130701) with 99% query coverage and E-value of <0.0001 and with that of B. ignitus (taxid: 130704) with 99% query coverage and E-value of <0.0001. Sequences of vitellogenin orthologs were obtained for three Bombus species and Apis mellifera (Additional file 1, GenBank accession numbers for all orthologs can be found below). The complete protein sequences (translated from mRNA) were aligned using ClustalW2 packaging in BioEdit 7.2.0, using the full multiple alignment feature. Alignment parameters were set to Bootstrap NJ tree with number of bootstrap set to 1000. Open reading frame for B. terrestris was selected between nucleotide 11 to 5350 using ORF finder. Accession numbers were as follow: Bombus terrestris: XR_131915.1; Bombus hypocrite: GQ340749.1; Bombus ignitus: FJ913883.1; Apis mellifera: NM_001011578.1. Total RNA was extracted from the head or abdominal fat body of individual bumble bees, either queens or workers, using the RNeasy mini kit (Qiagen, Valencia, CA) according to the manufacturer’s instructions. Abdominal fat body contained the abdomen cuticle and the fat body attached it, while the contents of the abdomen, including intestine, ovaries, and sting complex, were removed during dissection on dry ice. RNA quantity and quality were assayed with a ND-1000 Spectrophotometer (NanoDrop Technologies, Wilmington DE). cDNA was synthesized according to the manufacturer’s instructions using 500 ng of RNA with Reverse Transcriptase (Invitrogen, Carisbad, CA, USA). The first strand cDNA reaction was diluted by adding 35 μl of ultra-purified water and stored at -20°C until use. Two microliters of diluted cDNA were used together with 5 μl SYBR-Green (Bioline, Luckenwalde, Germany), 0.2 mM of each gene specific primer and 2.6 μl DEPC-water for the gene expression assay. Primer design for vg (Fwd: 5′AAGAATCATCTGAGCAACGTGA 3′; Rev: 5′TAGTGCACTGTTTGCTTTTGGT 3′) was performed using the Primer3 v 0.4.0 (http://frodo.wi.mit.edu/). To control for PCR efficiency and individual differences across samples, two housekeeping genes were used: Arginine kinase (AK) (Fwd: 5′ TGTCGGTATCTACGCGCCTG 3′; rev: 5′ TTGGTGGATGCTTGTCAGTC 3′) and Phospholipase A2 (PLA2) (Fwd: 5′ GGTCACACCGAAACCAGATT 3′; rev: 5′ TCGCAACACTTCGTCATTTC 3′) . Expression levels of vg were determined using quantitative real-time PCR on an ABI Prism®7900 sequence detector with SYBR Green detection method (Applied Biosystems, Foster City, CA, USA). Triplicate reactions were performed for each of the samples and averaged for use in statistical analysis. Quantification was based on the number of PCR cycles required to cross a threshold of fluorescence intensity (Ct), using the 2-∆Ct technique. The geometric mean of the two reference genes was used as a control. Negative control samples (cDNA reaction without RT enzyme) and a water control were also present on each plate. PCR product quality and specificity was verified using melt curve analysis. A standard curve was performed for each set of primers using 5 different concentrations of cDNA in order to determine the r (>0.96 for all primers) and efficiency (98%, 83%8 and 86% for AK, PLA2 and vg, respectively). We examined vg levels (heads) and ovarian activation in fertile and sterile workers and queens. Sterile QR workers (n = 6) were sampled from 6 different full-sized colonies. In each colony we individually marked callow workers (< 24 h old), returned them to their original colony and collected them 4 days later. From the same colonies we removed callow sister-workers and kept them in QL groups (2 or 3 bees/group) for 10 days (n = 6 groups). We collected 6 virgin queens (3-days-old or older) and 6 mated queens from the same colonies. To reduce the variability between subordinates and dominant bees in the QL groups, we always selected the reproductively dominant bee (based on her ovarian activation compared to her nestmates) for any analysis we performed. To examine the association of worker task with vg expression, we determined task, vg levels (head) and ovarian activation in foragers and nurses that were sampled from two additional colonies. These colonies were first kept under lab rearing conditions (i.e., not allowed to forage freely), and all emerging workers were tagged daily. Twenty days after first worker emergence, when the colonies contained at least 30 workers, food was removed progressively and the colonies were allowed to forage freely outside. The bees were allowed to acclimate to the free foraging conditions for one day, after which we monitored both foraging and nursing activities for 4 days. Foraging events were documented by observing the nest-entrance twice a day (6:00-7:00 am and 6:30-7:30 pm) and the in-nest activities were observed for 1 hour each day. The numbers of foraging and nursing events during the entire period of observations were summed for each worker individually (for more details see ). Four pairs of bees of the same age, one forager and one nurse in each pair, from each colony (8 pairs in total) were sampled. We examined vg levels (head) and ovarian activation in QR and QL workers that were sampled from 4 different full-sized colonies. In each colony we individually marked callow workers, returned them to their original colony and collected them 5 or 8 days later (QR group). From the same colonies we removed callow sister workers and kept them in QL groups (2 or 3 bees/group) for 5 or 8 days (n = 4 groups). From each group we selected the reproductively dominant bee based on assessment of ovarian activation as described above. For this experiment, we measured vg levels (head and fat body), ovarian activation and aggression in 15 groups of 7 workers, each taken from 14 full-sized colonies. The groups were established using callow sister workers of approximately the same size from each colony and placing them in small nest boxes. Groups were observed for 10 minutes each, 3 times a day (morning: 9:00-11:00 am; noon: 12:00-2:00 pm; evening: 5:00-7:00 pm) during days 3 and 4 (a total of 60 minutes per group) and three antagonistic behaviors were monitored: humming, darting, and attack (for definitions see ). On the fourth day we selected, based on the sum of aggressive behaviors that each individual worker performed and received, the most aggressive (1st in hierarchy), the most aggressed (2nd) and the least aggressive (7th) workers in each group. Expression levels of vg were measured in the heads (15 groups) and abdominal fat bodies (5 groups). Ovarian activation was measured in 14 groups only, due to a technical problem with one of the groups. Here, we measured vg levels (head and fat body), ovarian activation and aggression in order to test the effects of JH treatment on expression levels of vg under two different social contexts, “peer groups” and “established groups”. For the peer groups, we introduced each callow worker into a group composed of two sister callow workers of the same age and approximately of the same size. Since all three workers in the peer groups were callows, the introduced worker, if left untreated, had an equal probability to show aggression (and thus, to gain dominance) compared to her nest mates. If treated with JH prior to her introduction, on the other hand, it was hypothesized that the treated bee would show higher aggression and thus have greater probability of becoming dominant. For the established groups, a callow worker was introduced into a group composed of two equal-size but 4-days-older sister workers kept as QL pair. Thus, the callow worker was introduced into a situation in which the other two workers had already established an aggressive-aggressed relationship , and therefore the callow worker had a lower chance to show aggression and gain dominance. We hypothesized, however, that treatment with JH would upgrade her position in the hierarchy and consequently the likelihood that she would show aggression. The introduced workers in each of the group types were assigned randomly to one of the following treatments: untreated control, treated with 5ul of dimethylformamide (solvent control, DMF, J.T Backer cat: 7032), or treated with 100 μg JH dissolved in 5 μl DMF (JH-III, Sigma, cat J2000, purity ≥ 65%). JH or DMF were topically applied to the dorsal part of the thorax, as in  but see also [47, 79]. This treatment methodology using a slightly lower dose (70 μg) was sufficient to alter gene expression at a 4 day time point . During days 3 and 4 post-introduction we monitored the aggressive behavior that was performed and received by the introduced worker and the total aggression exhibited in each group. The introduced bees were sampled after 4 days. For this study, we used in total 14 colonies from which we created 110 groups (83 peer groups divided into 28 control, 29 DMF, 26 JH; 27 experienced groups divided into 8 control, 10 DMF, 9 JH). We analyzed only the introduced bees in each group. We collected data on ovarian activation in 83 introduced workers (65 peer and 15 experienced groups), monitored the behavior in 56 groups (27 peer and 27 experienced groups), and quantified vg in the heads of 15 introduced workers (only peer groups), and in the abdominal fat bodies of 68 workers (53 peer and 15 experienced groups). As additional control, we used another 3 colonies from which we created only untreated groups, either peer (n = 15 groups) or experienced (n = 16 groups), and kept the introduced workers for 7 days in order to test for any long term differences in ovarian activation of the workers that were introduced into these two groups. The data were tested for normality using a Kolmogorov-Smirnov test for normality. We used non-parametric tests each time the data sets were not normally distributed or sample size was small (<8 individuals). To test the effect of caste, ovarian activation, age and social condition on vg expression levels in experiments 1 and 2, we used a Mann-Whitney test. Since foragers and nurses were sampled as matched pairs of the same age, we used a Wilcoxon paired t-test to compare the differences related to task. The effect of JH treatment in peer vs. experienced groups in experiment 4 was compared using a nested ANOVA (treatment (JH, DMF, untreated) nested in group type (peer/experienced). When data are presented as percentages/proportions, they were transformed using arcsin before performing the parametric tests (in the cases where parametric tests were used). Data are presented as mean ± SE. Significant differences were accepted at α = 0.05. We would like to thank Tracy Baumgarten from the Grozinger lab for assistance with the qRT-PCR experiments and Naomi Paz for editorial assistance. The work was supported by a grant from The Israel Science Foundation founded by the Israel Academy of Sciences (ISF grant no. 535/08) to A.H., and by a Prof. Rahamimoff travel grant for young scientists, which supported the travel of EA from Israel to US. EA carried out the behavioral, physiological, and molecular analyses, including the sequence and phylogenetic analyses, designed the study and wrote the paper. OM participated in designing the molecular analysis and dissections. CMG and AH designed the study and wrote the paper along with EA. All authors read and approved the final manuscript.